Fisheries and aquaculture are increasingly becoming a primary source of protein and micronutrients, foreign exchange, livelihoods, and well-being for the population in the ASEAN region. 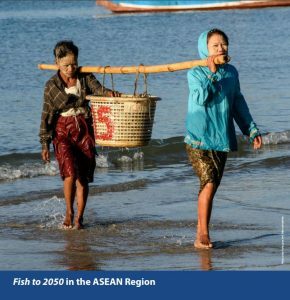 The new WorldFish/IFPRI report presents a baseline projection of fish supply, net trade, consumption and nutrition in the ASEAN region to 2050. According to the paper, fish production in the region will continue to grow and is likely to reach nearly a quarter share of global fish output in 2030 and then sustain this share to 2050. The business-as-usual projection was created based on the industry-specific biophysical and socioeconomic factors, such as environmental management and ecosystem carrying capacity plus socioeconomic targets defined by national governments during a stakeholder consultation workshop at WorldFish in June 2016. The research team used the International Model for Policy Analysis of Agriculture Commodities and Trade (IMPACT) of the International Food Policy Research Institute (IFPRI), with an updated fish model developed in collaboration with WorldFish, the Fisheries and Aquaculture Department of the Food and Agriculture Organization (FAO), and the University of Arkansas at Pine Bluff. 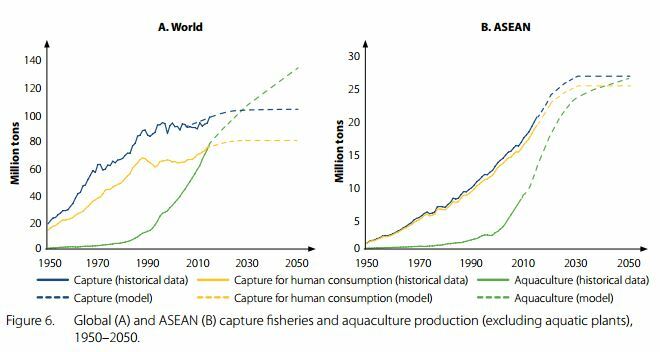 In the ASEAN region, fish production will continue to grow and likely to reach nearly a quarter share of global fish output in 2030 and then sustain this share to 2050. 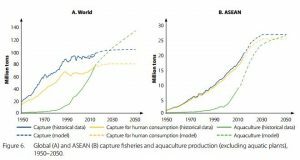 Aquaculture is expected to supply more than half of the fish consumed in the ASEAN region in the coming decade. Pangasius and other catfish, carp and tilapia will continue to be the major species produced from aquaculture. Continued dominance of capture fisheries as a source of fish supply is projected in the region through to 2050. Higher per capita fish and fish oil consumption will increase the nutrient intake from fish in the ASEAN region. Regional fish and fishery products will continue to be broadly traded given the balance of regional supply and demand in the near future. Aquaculture and capture fisheries have important, complementary roles to play in ensuring that fish remains available and affordable in the region. Policies to promote sustainable aquaculture expansion and law enforcement in fisheries management are critical to ensuring sustainable growth of both sectors. This work was undertaken as part of the CGIAR Research Programs on Policies, Institutions, and Markets (PIM) and Livestock and Fish (L&F), by a team of scientists from WorldFish and the International Food Policy Research Institute (IFPRI). Funding support for this study was provided by the Bill and Melinda Gates Foundation, L&F, and PIM.